Introducing the latest money making app in the building with some similarities with Slide Airtime App but better and interesting way of points accumulation. 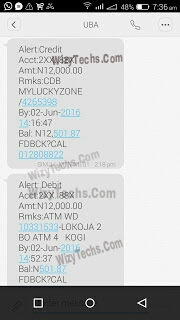 If you have been following our thread on this blog WizyTechs.Com about free Airtime apps like Sliide, MyAds, WhatsCall e.t.c, you will agree with me that it sometimes helps a lot especially when you are broke. I know of a lady in this blog that uses slide app and whatscall app to buy data bundles of her choice. She accumulates a huge amount of airtime and use part of it to subscribe for any data plan. Up till now most people are still enjoying and earning money 💰 from these apps. 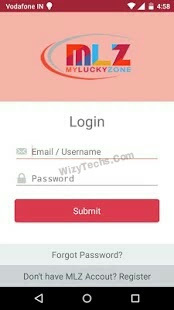 While i was doing some research recently online, i came across another money 💵 earning application called MyLuckyZone app. After reading more about it, i decided to test the app with a new bank account and viam... It was successful. The app works like slide airtime and as usual, you need to work a little bit hard to accumulate a reasonable amount in little space of time, if not you could remain in 100 points for one month. "MLZ" app is easy to use and you can gain more points in just a minute, when you browse your favorite sites like Facebook, OLX, Konga, Dealdey, Jumia, MTNONLINE, ETISALAT e.t.c via the MyLuckyZone app. After reading this post, you can start earning your own money and cash out once you meet the requirements. You also get points by referring others. For example, staying online and referring 5 people will grant you 500 Glo or Etisalat card under the categories of Silver Sales. HOW CAN I EARN AIRTIME AND CASH OUT ON MYLUCKYZONE APP? Now Login with the App and go to "My Profile". Fill all your profile details and remember to your your "mobile number". To start earning money from the app, just tap on "Earn points". You will see a list of websites including Facebook, OLX, Konga, Dealdey, Jumia, MTNONLINE, ETISALAT e.t.c. Just start browsing any of them. To earn more, select sites with higher points and those that you can stay more online on - to increase your point accumulation. To see all your accumulated points, click on "Products" to view your Points balance, keep browsing different websites provided in the "Earn Points" until you have at least 1000points. Finally, click on the share button to share your Referral link with friends on social media platforms to accumulate more points. The higher you share, the more points you get. You can browse through Facebook to get 10,000 point within 5mins. Immediately you get at least 5 referrals and 1000 points, kindly go to Silver sales to purchase your airtime and and cash out ASAP. HOW CAN I CASHOUT ON MYLUCKYZONE? ✔ Then click on All Category and a menu will come up. ✔ Then you click on All which is the last option below and choose the stage you are on be it Platinum Sale, Gold Sale and Silver Sale. ✔ You will now see all that is available for you to purchase in your various stages. 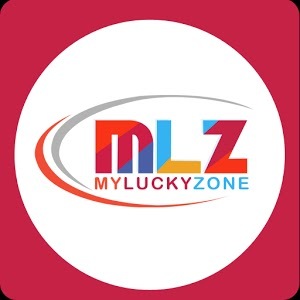 ✔ After making the purchase, within 24hrs you will get a call from Myluckyzone to confirm your purchase and then whatever you purchased will be sent to you. NOTE: You can only make one purchase a day, but if you now get an additional four more referrals you can purchase again. Why not test this app and start making some money while you browse some websites? It is undoubtedly, a rival airtime generating app to Slides Airtime. How can I cash out through my bank details? No link to download it sir. MyLuckyZone sends Calling Cards and Cash to their users for browsing. 2. After verification Log-in and download the App. 3. Log-in with the App and goto "My Profile". Complete your profile details and include your mobile number. 4. 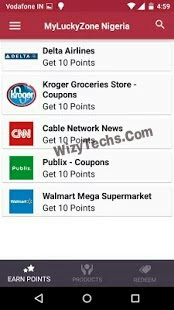 Click on Earn points and Browse your favorites site from the list provided, Choose sites with higher points for fastr point increment. 6. You're set, Click on the share button to share your Referral link with friends. Here's the link....to download the app...shared via dropbox to be easy to download..
How do you cash out to your bank account???? Please Oga wizy you just made my day one question tho How can I cash out through my bank account? i have five referrals already but when i want to purchase it still says you need five referrals. Throw more light on this pls cus am unable to cashout, they say i need five refers. could you pls explain how you did yours? i have five referals , i also have over 10000 points but i clicked on silver sale because am already on silver elite member ..all i see is #400 mtn nd some other network card but i cant purchase more than one...any remedy to thats and also how did u cash out that money on your screenshot what was the requirement? Way To Get Unlimited Card Everyday From myLuckyzone!!! 3. Log-in with the App and goto "My Profile". higher points for faster point increment. your Referral link with friends.